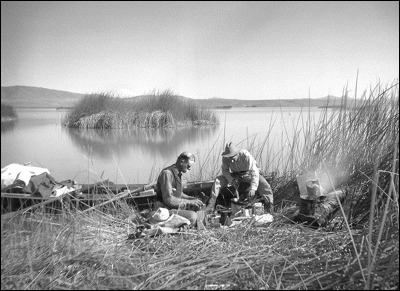 In 1905, wildlife photographer and writer William L. Finley and his friend Herman T. Bohlman headed out on one of their photography treks, this time to Tule Lake. 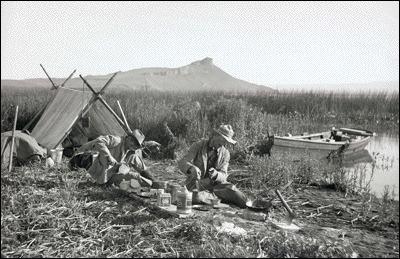 They camped on tules on the lakeshore, but quickly discovered what the natives had known for centuries. 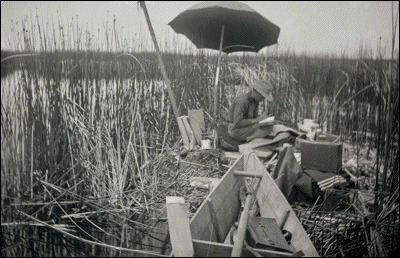 Tule reeds are hollow, and when weight is added to them, they become waterlogged. The Modocs had the same problem with their tule boats. After paddling through the marsh for a couple of hours, the boats would start sinking. Then they'd lay them out in the sun for a spell to dry them out, before heading out again. Finley and Bohlman, after a night of sinking slowly, woke up wet in their beds! So when they headed out to Malheur Lake in 1908, they had a plan. Finley writes: "The first night out, we ran our boat into a bunch of tules and tried sleeping in the boat. Besides being a little too narrow, the seat and supports divided the boat into two compartments. We tried a series of experiments from a man in each compartment, doubled up with his head on his knees, to sleeping with our heads in one compartment and our feet running over into the second." A similar challenge would haunt romantic couples for decades following the invention of bucket seats! Finley continues: "The second night, we tried the roof of a rat house. I stepped out on the roof rather gingerly at first and was glad to find the house comparatively strong. I flattened the top of it somewhat and it made a raft large enough to stretch out upon. A few moments later two scared muskrats appeared at the surface of the water about thirty feet away and going straight out toward the middle of the lake. They were frightened half to death at the sudden earthquake that jarred the very foundations of their home. They had evidently never had such tenants before." Experimenting through the week, they found that a muskrat house would last two or three nights before it started sinking from their weight into the lake. One night, thinking they were high and dry, they got rained on -- heavily. Finley writes: "We were then in the predicament of too much water above as well as below. We covered our boat and equipment with canvas, set up our umbrella blind in the middle and tried to curl around it. We had to use our canvas to cover our cameras and equipment in the boat. The rest of the night we sat back to back, knees up and toes out, waiting for daylight. "This living on the top of a muskrat house was not the most pleasant of accommodations but what we could do. I do not know where the muskrats slept but hope they got better rest than we. Sometimes as I lay awake at nights I wish I had been built like a rat. The third day the rat house showed wear. It looked like a wreck, too dilapidated even for the rats." 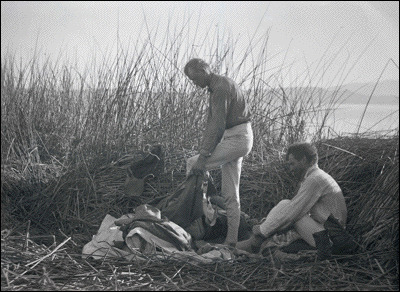 The first photo shows Finley and Bohlman in one of their drier camps on the shore of Tule Lake in 1905 -- this was called Rattlesnake Camp -- and then there are two photos of them camped in the reeds. 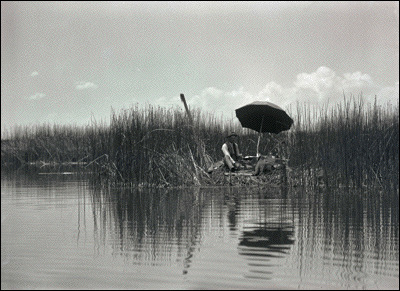 Note that these photos show the landscape and lake as the Modocs had experienced their homeland for thousands of years. But that would change quickly. By 1907, to accommodate homesteading and farming, the first major water diversions began. Today, Tule Lake is 13% of its original size. The last two photos show the 1908 Malheur camp on a muskrat house -- with umbrella blind in place!